Patrick McKee has confirmed his defection from Fianna Fáil to Ireland’s newest political party. KILKENNY COUNCILLOR PATRICK McKee has confirmed his decision to quit Fianna Fáil and join Renua Ireland, where he will be the party’s candidate in the Carlow-Kilkenny by-election. 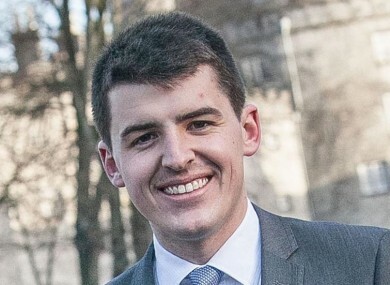 McKee, 26, claimed the hierarchy of Fianna Fáil have “failed to take on the change that is required” as he announced his intention to run for Lucinda Creighton’s new party in the 22 May by-election. He is the vice chair of Kilkenny city council who was only elected as a Fianna Fáil councillor last May and had until recently been campaigning with its by-election candidate Bobby Aylward. However, the Sinn Féin councillor and by-election candidate Kathleen Funchion has claimed that McKee had sought to join her party before switching to Renua. McKee has completely denied the claims this evening, telling TheJournal.ie he did not approach Sinn Féin and ask to run for them. “At this meeting he clearly expressed his unhappiness with Fianna Fáil and his interest in joining Sinn Féin. While he understood that I would be the Sinn Féin candidate for the forthcoming by election, he did express his desire to run in future elections. Pat even went so far as raising the timing of when he would make the move, suggesting that a time after the by election would be the most appropriate. “I told him that he was free to make an application to the party. I left it up to him. He never followed through. We never chased him up. He never formally applied to join. @annearmagh @renuaireland I did not approach SF or any other party at any stage prior to joining Renua. In an interview with TheJournal.ie this evening McKee insisted that he did not seek to join Sinn Féin, while acknowledging he did meet with Funchion in January. “I had a coffee with Kathleen and a bite to eat as well. We both serve on the council and me meeting her is not unusual. I count Kathleen as a friend. I would have discussed, on several occasions, my disappointment with the political establishment. I did not approach Sinn Féin and ask to run for them and any suggestions to the contrary are untrue. It’s clearly Sinn Féin advisors in Belfast engaging in the usual political spin. It would if it was in that context. I had met with Kathleen on several occasions, as well as many other councillors. I never said that. No, I never said that. I’m absolutely sure, 100 per cent. Speaking to KCLR 96fm earlier, McKee said of his decision to leave Fianna Fáil and join Renua: “The members of Fianna Fáil, the ordinary decent people in the community and the ordinary decent people in the community in every political party are good people, they’re committed to their communities. But the hierarchy of Fianna Fáil have failed to take on the change that is required. They’ve had several opportunities since the economic crash, they’ve failed to reform their structures and I feel that I’m not prepared, being a 26-year-old in my generation, to accept that. Speaking to TheJournal.ie earlier today, the Fianna Fáil TD Timmy Dooley said the party had invested a lot of time in McKee. Speaking to Today with Séan O’Rourke, McKee insisted that his unhappiness with Fianna Fáil is not an issue with Micheál Martin or personalities within the leadership. “I entered public life to make a difference and I am committed to making that difference and my only loyalty exists to the people of Carlow Kilkenny and to my message and my vision and that’s all,” he said. Email “'I never said that': Renua's latest recruit denies trying to join Sinn Féin”. Feedback on “'I never said that': Renua's latest recruit denies trying to join Sinn Féin”.